Finally, you can have the best of both worlds in one box! Now get 10 pounds of Seasonal Grapefruit* and 10 pounds of Delicious California Oranges together in our new "Seasonal Grapefruit and Orange Combo Box" from Pearson Ranch! You've asked for a combo box like this, and we've delivered. Depending on which variety of deliciously ripe grapefruit is in season at the time of your order, *(Pomelo, Oro Blanco, Melo Gold, Star Ruby or Marsh Ruby), we'll pair that with fresh picked, and hand selected California oranges, and ship them right to your door for you to enjoy! Most varieties of grapefruit have only 60 calories per serving (1/2 grapefruit) and of course they're always fat and cholesterol free, and are packed with 100% of your daily requirement of Vitamin C! Love® Premium Oranges from Pearson Ranch are grown in the "heart" of "The Orange Belt" of The San Joaquin Valley, California. Tended to by the best farming crew with years of experience, and irrigated by deep well water obtained from run off from the mighty Sierra Nevada mountain range, and raised under that famous "California Sunshine." You can't help but to LOVE this fruit. So what are you waiting for? 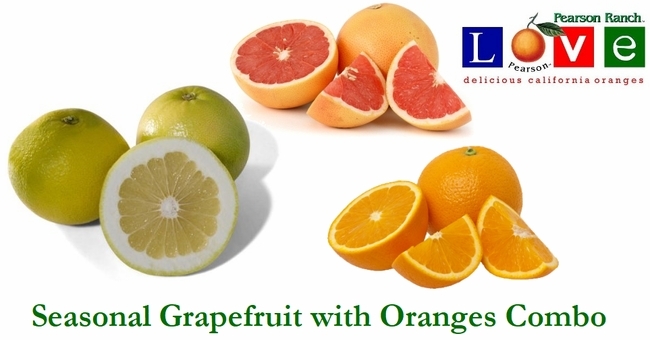 Your combo box of 10 lbs of seasonal grapefruit and 10 lbs of beautiful navel oranges awaits! A few words about shipping... Pearson Ranch can ship fresh citrus ANYWHERE in the U.S., Including: Texas, Louisiana and Arizona! Also... you only pay for the shipping you actually need! We don't insult our customers by CLAIMING to offer "free shipping", then stick the cost into the price of the fruit! Please COMPARE "other" on-line fresh fruit vendors and see if what you pay for is what you're really getting!